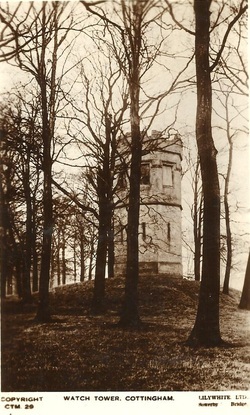 The Gothick tower known as Thompson's Folly was built in about 1815 as an eyecatcher from Cottingham Castle. It was also a belvadere for viewing 'the lovely land on every side', including the Humber. Thompson was a banker in Hull and had Cottingham Castle, a crenellated mansion, built in the early 19th century. It burned down in 1861.